Hill Dickinson are perhaps more famous for acting on behalf of professional footballers, but currently it is the turn of the parking company. No doubt Rachel Ledson is far too busy issuing 1800 parking charges a week to do this herself. I manage ongoing projects. I produce civil documents for the works that need carried out. I manage one surveyor and his work. I organise materials and equipment that need to be on site to get the work carried out. As criminal investigations take precedence over civil action, currently The Prankster and ParkingEye are waiting for the result of the police investigation to complete. 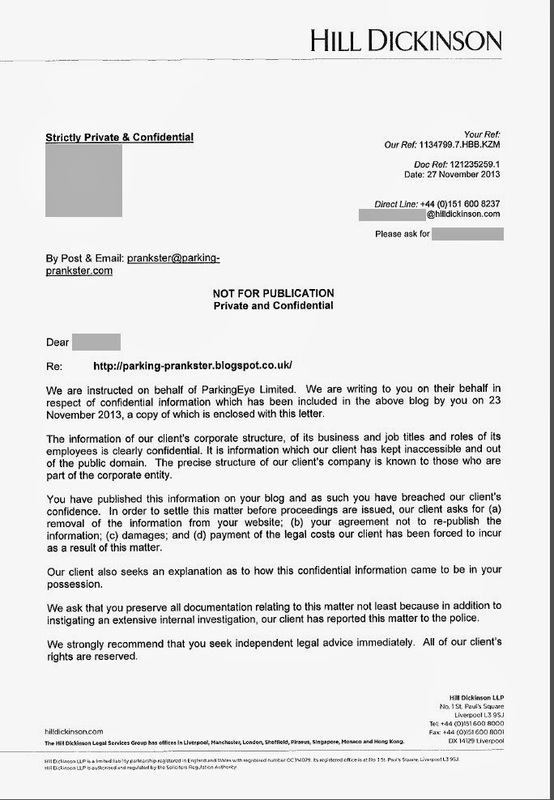 The Prankster has asked ParkingEye to provide him with the name of the police officer any crime was reported to, the crime reference number and the nature of any crime reported, so that he can take legal advice and make himself available to the police for interview, but so far they have not responded. When staff apply for a job elsewhere do they put "Top secret" as their job title on their CV? You can get the names and titles of most of their staff via Linkedin. I'm amazed that they are taking this kind of action! I doubt very much that they care about their corporate structure being published. They clearly think they have a mole in the camp and judging by their ongoing dodgy dealings this would be a big concern to them. I'm looking forward to 'Dispatches' doing one of their exposes on these characters, can't be far off now. Do Hill Dickinson know something that we don't? The Prankster can only have breached PE's confidentiality if here were privy to their corporate secrets in the first place e.g. he is a PE employee or perhaps a client who had signed a confidentiality agreement. Publication of publicly available data as the result of research is called journalism. A letter from a run of the mill High Street solicitor runs to about £100 so one from Premiere League self-confessed lawyers like Hill Dickinson must be a several times that. Presumably the costs of this action will now be included in Parking Eye's Genuine Pre-Estimate Of Losses (GPEOL) presented to POPLA. And if Parking Eye's operations are so secret, how can the costs of those operations be reclaimed in a public court. Damages as a remedy are intended to return the agrieved party to the position they were in prior to the issue in question or event. How exactly have PE suffered a loss at all as a consequence of the publishing of information that can be pieced together based upon profiles availlable in the public domain? £16,500 !! are they having a laugh... we pay our lowest paid admin assistants more than that. So they apparently are as mean and penny pinching to their staff as they are to their 'customers'. Don't forget they have to pay Ms. Ledson £50 for every court paper they file. So very little money left for the rest of the staff. And why does Parking Eye think it now has control of the internet? I would love to see that 'Land Owner' witness statement. Responsible for engaging managing agents & pension funds who wish to protect thier asset and actively manage the car park environment. My current role at ParkingEye Ltd has given me the opportunity to build a department within an already substantial and profitable Car Park Management company. Initially recruited to the company to offer some insight into the procedures and legislation needed to implement their own infrastructure team. Having observed the company utilise sub-contractors to meet client’s requirements and expectations, it was a challenge to implement a new resourceful department within an already fledged car park management sector. Since my employment at ParkingEye, I have been able to improve working practices and develop new techniques to assist in the operational function of the business. The opportunity to work at ParkingEye has given me great satisfaction, and whilst assisting in my own personal development, it has helped others around me. As my responsibilities have grown it has become increasingly important for me to keep abreast of current legislation. I take a proactive approach through my continuing professional development, technical circulars, and trade journals. Recent developments have focused my attention on Health and Safety, Risk Assessment and best practice and value engineering. I believe given an opportunity, I would be a valuable asset within any organisation. I consider myself self-motivated with a leadership management style. My aim is to always strive for improvement, strengthen relationships and ensure the successful continuance of business operations within an organisation. General Counsel of a new legal function for a growing entrepreneurial business (commercial, corporate, regulatory and debt recovery). 2011 - present - General Counsel - Head of Legal Services (Commercial Contracts, Corporate, Regulatory, HR and Debt Recovery). As Mr Pranky was using the information under the fair use method to report in a journalistic manner then these clowns should get referred to the reply given in Arkell v. Pressdram. Rachel looked at the clock and then looked out the window. Was it really only 9.30am? It seemed like she had been there for hours and outside the sky was a stormy sort of grey. The last 12 months had been a roller coaster of emotions and experiences for her and she took the time to reflect upon this. How could it be that less than 12 months ago she was being feted as a champion by all those other BPA Ltd registered PPCs for daring to blaze a post PoFA trail for collecting cash from innocent motorists to where she was now? Why was it all turning to dust? Also; how dare that Prankster; he had been a thorn in her side for some time but now he had finally published his guide and his book about the tricks used by her employer to extort money from people who breached their “made up” rules about how you could use a car park. Of all the tribulations she had had to face in the last 12 months this was the one that had stung her to the core. It was now clear to the world what a crooked and deceitful company her employer was and to make it worse it was now all over the bloody Internet. The Pranksters guide outlined most of the tricks she had deployed but she smirked quietly to herself that the Prankster had not spotted them all. In terms of hurt this was more painful than the comments from her colleagues in the accounts section who after paying court costs to motorists who had defeated her employer in court had said quite pointedly “Rachel, surely it should be the other way round? The motorist should pay us not we pay them”. That had hurt but not as much as those other recent losses in court, which showed the whole house of PPC cards was fluttering in the wind. Rachel cast her mind back as to the grounds upon which they had lost; “No Contract” was one she could recall, “No Authority” was another and then there were those predated witness statements, which had lead to Court Cases being dismissed by the Judge. Why oh why couldn’t her colleagues in the Claims Team do their job and make all that backdated documentation fit together properly? There was no way she was going to carry the can for that one. And then was that Genuine Pre Estimate of Loss; if only those bloody parking forums had kept their noses out of that! And they had the cheek to be counting down for the 100th loss for her employer at POPLA on this point. Rachel took the time to inwardly smirk, as she knew her employer had already lost more that 100 cases at POPLA on this point as not all those who go to POPLA talk on the wretched parking forums. Nearer to home, life in the office was not what it used to be. There was an air of unease amongst the admin staff that seemed to think they would soon be sacked and their jobs moved elsewhere. And then there were also all those visitors from their “new friends”; why was it some of them stopped talking when she entered the room? And then there were those looks she noticed, were they of pity or were they smirks on the faces of the new visitors that she sometimes noticed across the meeting room. All in all it had been a very stressful year the courts were now agreeing with those damn motorists, POPLA were agreeing in favour of those damn motorists and hanging over all of this were the tough financial targets she had now to meet if their new friends were not going to ask for their money back. She was also uncomfortably aware that the SRA were also starting to look in her direction following some Internet forum driven complaints and then to cap it all that bloody Prankster had published those guides. Thinking idly to herself, Rachel thought of Winsford, maybe the Red Cow Yard Gang might be a better place to be; it wasn’t that far down the M6 after all, perhaps they would see that she did really know how to change the world in PPC land and welcome and appreciate her knowledge. Rachel looked again at the clock, the hands seemed to have barely moved and outside the sky had become an even darker shade of grey. I thought that it would be impossible to come up with a bigger load of hogwash than the stuff contained in PE's Reply to Defences, but Hill Dickinson seem to have managed it. They, and their clients, have clearly never heard of The Streisand Effect. Perhaps HD, and other law firms of that ilk, should apply for membership of the British Kite Flying Association. Anybody remember Andrew Crossley and ACS Law? The future of Ms Ledson and PE perhaps? I'm guessing that by then they will have been reported to the SRA for their letter when it becomes clear that the police are not interested in the case [if they were ever informed properly in the first place]. Hmmm, in my opinion it seems like harassment with intent to cause fear and distress to me in a vexatious way, so it's following the apparent PPC business model, now that is a criminal offense that the police would involve themselves in. They also talk of fiscal payment as recon-pence based upon this attempted harassment, so doesn't that add demanding money with menaces and possible fraud into the mix? How do they have your postal address Mr. Prankster? Is that not 'inaccessible and out of the public domain'? I hope you've told them what they can do with their demand for damages...! I like the "Private and not for publication" message. Why they think that has any legal standing, I don't know! UKPC "Do we really take people to court and win?"